Nine days before the election, the campaign is fiercer than ever, and the focus is now on the spreading of fake news on social networks and applications. RIO DE JANEIRO, BRAZIL – The PT candidate for the Presidency of the Republic, Fernando Haddad, will spend part of today (October 19th) in Rio de Janeiro where his opponent Jair Bolsonaro (PSL) lives. The PT candidate has a meeting with researchers, professors and students in the areas of science and engineering. 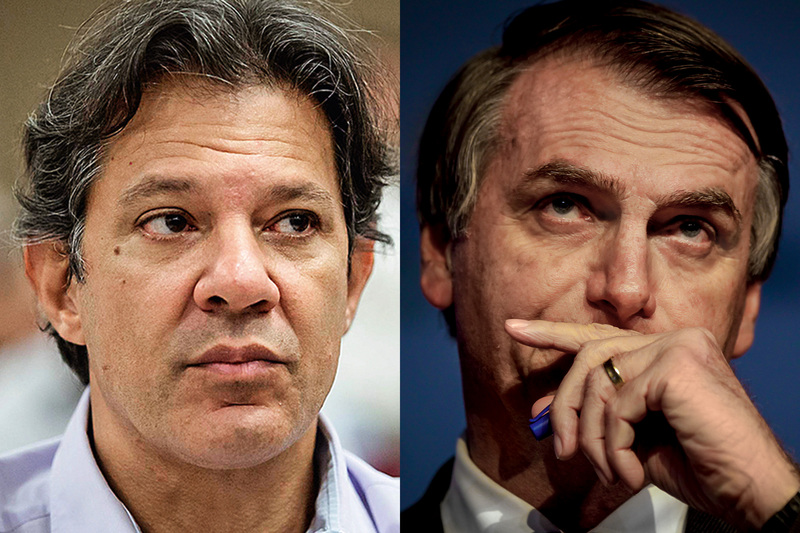 In the second poll from Ibope for the October 28th presidential runoff elections, Haddad (left) has 41 percent of voter intentions while Bolsonaro (right) has 59 percent, photo recreation. Haddad will also participate in a meeting at the Engineering Club for the debate “Democracy and sovereignty: University, Science and Engineering for Brazilian development”, according to a report by a government news agency. Bolsonaro yesterday (October 18th) in a live broadcast on social networks indicated that he does not intend to participate in debates nor does he intend to do street campaigns. According to him, he fears for his own safety after being stabbed while campaigning on September 6th in the state of Minas Gerais. Nine days before the election, the campaign is fiercer than ever, and the focus is now on the spreading of fake news on social networks and applications. The candidates exchange accusations, while the political parties turn to the Electoral Justice in search of measures. Today there will be a press conference with the participation of the President of the Superior Electoral Court (TSE), Rosa Weber; Ministers Raul Jungmann (Public Security) and Sérgio Etchegoyen (Office of Institutional Security of the Presidency of the Republic), the Attorney General of the Republic, Raquel Dodge. The expectation is that the institutional measures will be announced which will be adopted as a result of questions raised in the first round of elections. Yesterday, Raquel Dodge warned of the risks of spreading false content. Bolsonaro and Haddad will go head-to-head in the second round runoff to decide Brazil’s next president on Sunday, October 28th. In the first round, on Sunday, October 7th, Bolsonaro led the field with 46 percent of the vote followed by Haddad with 29 percent.